Hillview Middle School held it open house on Thursday evening, May 19th. It kicked off with the announcement that Principal Wally Haug’s wife had given birth to a baby girl earlier in the day, along with some updates about the school’s new mission statement and testing procedures. After that families went around to look at projects in various classes including visual book reviews, poetry, scanning QR codes that connected parents to student presentations, and models of cars designed to travel in the desert. Students were stationed and rotated around campus to demonstrate different skills to guests. 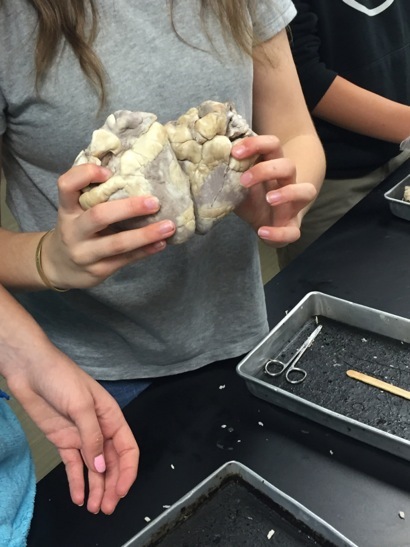 They greeted families in Mr. Chang’s 7th grade science class to explain how blood flows through the heart by demonstrating with dissected sheep hearts and encouraging guests to touch the hearts and see how they work. They also connected two sheep hearts to show how humans came up with the shape of a heart by putting two hearts together!